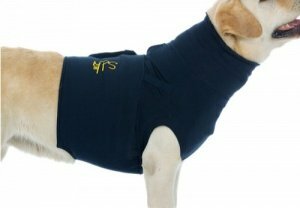 From the people behind the bestselling Medical Pet Shirt comes this Protective Pet Topshirt. 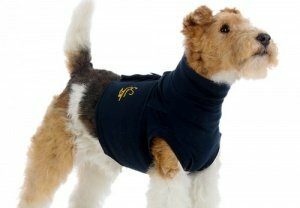 Whilst the original shirt provides full torso and belly protection, the shorter Topshirt is a protective covering for the top half of your dog's body. 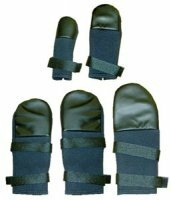 Ideal for protection and comfort after middle to upper body operations or for injuries, wounds and skin conditions. 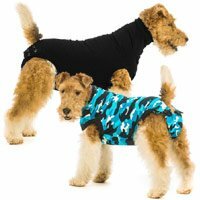 These protective shirts allow freedom of movement and can be much more secure, effective and convenient than using a traditional Elizabethan cone or buster collar. The gentle pressure on the torso can even have a calming effect on dogs, reducing fear and stress. Soft cotton double skin fabric around the body. Stretch fabric front side made from cotton and Lycra with reinforced cotton bands. Adjustable closure around the chest. Comfortable, hygienic and can be washed at 30 degrees. A small pocket on the back of the vest can hold devices such as IV or suction pump etc. For your dog's chest circumference, measure behind their front legs. 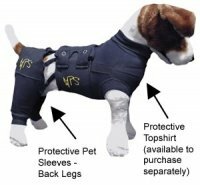 The shirt wraps around the body and closes with Velcro so it is easy to fasten over wounds and injuries. Please note that, as with bandages or other protection, a determined dog may pull, tear or chew at the product. Use under supervision. 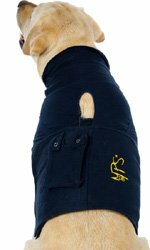 If your dog’s injury is further down the torso or if you want protection for incontinence, a neutering operation or for a dog in season, please see the full torso Suitical Dog Recovery Suit. 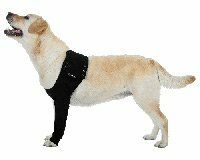 The video below shows Suitical Dog Recovery Suit (formerly Medical Pet Shirt), Topshirt and Leg Sleeves. This second video shows how to fit the Topshirt and how to use it with the back leg sleeves. Bought following a recommendation from our vet for a Labrador that's developed a bald patch on his lower chest which has become sore after rubbing on hard floor - no matter how much bedding we provide he chooses to sleep on the laminate floor! Has been wearing the shirt for 10 days now, pyoderma is healing up nicely and he looks very smart wearing the shirt. Only downside is the never ending nature of a shedding Labrador coat means that the Velcro area is now covered in a fine layer of yellow lab hair, despite being washed after 1 weeks wear. Velcro still sticks perfectly though. Very happy with this purchase and would thoroughly recommend it to others. Good quality, smart look, comfy fit, bought large size, fits perfectly. Dog very happy to wear it. Very quick delivery time too. Its so good I have bought another one since original order. My pointer recently had a lipoma removed from the underside of his chest. This shirt provided protection from licking attempts and dirt. Vet was impressed as it also provided a compression effect. Bought the top shirt and the back leg leggings for my Briard to keep her from licking her wound after cruciate surgery. What a fantastic bit of kit, she was happy to wear it, I actually think it comforted her. When we attended the vets, two weeks after the operation for suture removal, the wound was fully healed and looked perfect. I would recommend anyone whose dog is having surgery to consider buying these items, they were a god send, they wash easily and even though the weather was really hot it didn’t make her hot at all. My Briard is eleven and a half years old and she has made wonderful progress after her op, I was told it may take her longer because of her age but she is walking well and apart from a shaved leg you would t know she had her op and I am sure these items were a major factor in this. I highly recommend. I was relieved to find this item. My dog had an injury on her rib cage that she could both lick & scratch with her hind foot. 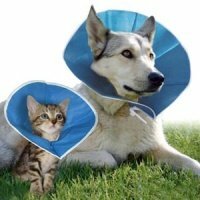 A cone stopped the licking, but I needed something to protect the wound from being scratched. This did the job perfectly. All dog owners should have one just in case. My young whippet recently required major surgery on his neck/chest nothing seemed to work to keep the wound clean and safe. 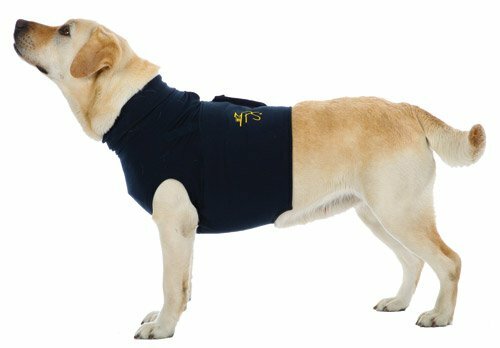 Saw these and thought “nothing to lose” what a godsend these have been ( I bought two so there was always one ready for changes) the vest keeps a dressing securely in place and has the added bonus of keeping the dog calm as soon as his vest goes on the dog visibly calms all good for the healing process. Unlike the Elizabethan collars the vest allows freedom of movement. I cannot praise these highly enough. Very good fit and quality, saved my dog having to wear a cone that freaked her out, also excellent delivery time. I now have two of these...so I can wash one! Great quality product, fits well and protects my dogs hind let stopping her licking it. Customer service is amazing too...thank you so much to the staff. Excellent service!! Ordered yesterday, received this morning. 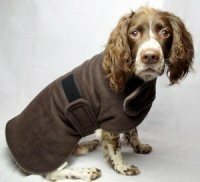 Fits my dog perfectly, very soft too. Will definitely be returning to your site.